Even God Benefits from the F1. The Formula One brings in enthusiastic tourists who slap down millions of dollars in the host countries. 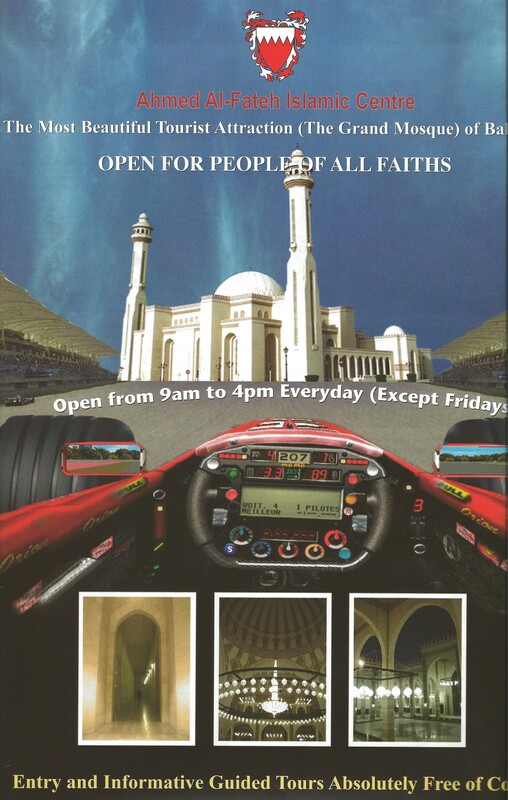 In Bahrain, between races, or when the spectators’ palms and pockets are empty, this ad points out there is another place to visit which offers free Love – the Al-Fateh or Grand Mosque. Recently, an Italian friend was visiting Bahrain. A group of us met at the Grand Mosque, left our sandals at the door and donned the required abayas and head scarves. Our guide, an Egyptian woman named Ghada, gave us the half-hour, building tour. Knowing my friend loves the Virgin Mary, I asked Ghada to explain Mary’s place within Islam. We made a circle of chairs and she pushed up her glasses, smiled and set her hands in her lap. “Can you tell us how many times she is named in the Koran,” I asked. “More times than in the Bible,” I added. We had a lively discussion about Mary’s virginity, divinity, and dreams. Several among the group made positive comments about Ghada’s informed and open views. “Because I want to understand what all people believe, I have read the Bible, both the Old and the New Testament. After reading them, I still felt more drawn to Islam,” she said. The Formula One, which attracts people from around the globe, is a great opportunity for us to meet others who share a common passion. I go to the F1 to watch the people as much as the race. I believe events like this help break down cultural stereotypes. Every time I have visited the Grand Mosque, I have had a delightful docent and have learned something wonderful about Islam. Visiting the mosque is an excellent way to understand Christianity’s, Islam’s and Judaism’s common beliefs. It is a quieter venue that, similar to the F1, highlights our common humanity. The Grand Mosque in Juffair is one of the places I always take my visitors. It is often the one chance people visiting the Middle East have to see a mosque. Most mosques in the Gulf limit admittance to Muslims. The al-Fateh Mosque is open to people of all faiths. During Ramadan, al-Fateh hosts free events. During the rest of the year, it is easy to pop in any time and find a multi-lingual docent who will take you on a tour. There is a library and free materials about Islam. A good representative for Islam, Ghada has written several interesting pamphlets which are available at the mosque. Women must wear an abaya and a head scarf to enter. The mosque has a closet full you can borrow. Or you can bring your own. The Grand Mosque is opposite the Gulf Hotel Complex. Sitting near the sea, it is easy to see from the main ring road. The trip can be combined with visits to the new Islamic library, the National Museum and the new, National Theater. Wonderful questions you asked Eva.. you are so good at that… a couple days ago I was in deep meditation working with a woman, asking her descendents to allow healing for her matriarchal line, and I saw a long straight line of descendents, and then all a sudden at the end of the line I saw Mother Mary with her arms outstretched… I had never “seen” her before… it was such a beautiful experience.. Very interesting. That raises so many questions in my mind that will never be answered. It sounds wonderful and affirming for your client. Healing so many lines. Wonderful.